Recorded at Ultrasonic Studios in New York, the 1974 WLIR broadcast session sees the band in rebound after a state of transition. The group had recently completed their second album, 1973s Radio City. It was their first as a trio, following the departure of founding member Chris Bell. Before the band could hit the road to support the record, bassist Andy Hummel left, as well. He was replaced with John Lightman. 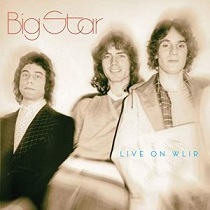 Together, the trio performs highlights from their first two long-players, along with a cover of Loudon Wainwright IIIs Motel Blues. The result is an essential document of vintage, live Big Star. While the broadcast has been issued before  on the early 90s Rykodisc CD, Live  every track on Live On WILR has been newly remastered and restored from the original tapes, ensuring a better listening experience. Track Listing: September Gurls, O My Soul, Way Out West, Interview, Mod Lang, The Ballad Of El Goodo, Don't Lie To Me, Thirteen, I'm In Love With A Girl, Motel Blues, In The Street, You Get What You Deserve, Daisy Glaze, Back Of A Car, and She's A Mover. New liner notes from authors Robert Gordon and Rich Tupica also include an interview with bassist John Lightman. GREAT! !